Balancing brewing time, brewing project time, and life is a fine balance, so you are likely hearing about projects that should have been long since completed, but might be stalled. I’ll try to avoid duplicating updates, if it’s not updated, it means it’s how it was left when I last updated. Keggerator update – I added a dolly with castors to make the keggerator a bit more portable. I’m not happy with the outcome, it is more portable, but wobbly and too tall. With the 2×10 collar and the castors it will be hard to get a full 5g keg in and impossible to get a 1/2 barrel in. I will also still need ramps to move it out of the basement. I need to rework the design to be lower, and more square. I’m thinking of outboarding the castors. Making the base extend past the freezer base, so the can be lowered. This would allow for storage of the co2, and perhaps a glass rack on the other end. I cleaned both lines during the last two keg swaps, so they are nice and clean. This is something I need to keep on my calendar for more regular cleaning. I have a project in mind to make this easier. I also did a C02 tank swap. I’m just glad I managed to avoid C02 leaks in my first year of Kegging. Left to complete on this project: reattach the drip tray in a usable way, Install insulation and some quality tape to seal it up, and hook up a fan for air circulation. 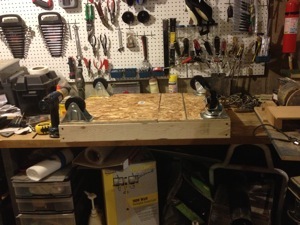 Stir plate – I wrote this up as a it’s own blog entry, and it’s still on the project list. I’ve taken four shots at this project over the past two months, and it has been the tale of two soldering irons, and it was the worst of times. 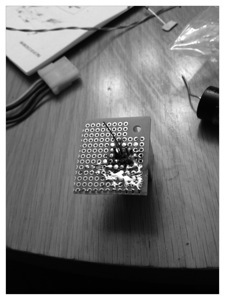 At this point I am waiting on my replacement soldering iron to arrive before taking another shot at this. I’m also buying a third hand device so I can be more precise. 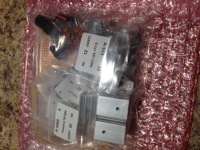 On a positive note, I’ve got 5 sets of components waiting for me. It only cost me $10. I think even with all the time I’ve spent, I’ll be ahead on this project when it gets completed. Hard to believe $10 worth of parts sell for $50-$80. It just goes to show you how cost effective DIY can be. When I complete this, I’ll have some parts up for grabs. I only ask you do a quick write up of your experience putting it together. Home brewery organization – I’ve acquired some small sterilite containers for breaking out my gear by function, cleaning, bottling, kegging parts, brew day additives (whifloc, salts, moss, etc). Next up is hanging some pegboard for storing my gear. Hot liquor tank – I forgot about a 30 qt aluminum pot from my turkey fryer that I wasn’t using. I’m going to add a ball valve, and this will be an ok sized HLT. I’m going to source the ball valve from from home depot no need for anything fancy. I won’t use a dip tube because I want to continue to use this pot for biab batches. Basement Sink – I got the ok from T to have a sink installed in the basement. I’m trying to identify the right spot to install it. It’ll be the basis of the home brewery so placement is important. It will be about $350 to have installed, plus the cost of the sink. I could do a really cheap dump sink, but I’ve been shopping online for a used stainless two bay with side board. This will make a huge impact on brew day efficiency as gear will travel less distance to get filled with water, and cleaned. As a result, I’ll have less kitchen clean up to do, which is T’s motivation. 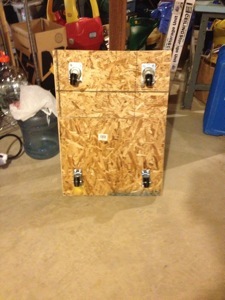 Brew stand/kart – My buddy Mike has started making a mobile brewing stand/cart. He sent me a photo. It’s made of simple 2×4’s and some repurposed wood I really like the idea of having my brewing gear portable. Not having to make multiple trips from the basement to the patio will save a ton of time. I have tossed around a few ideas, I’m thinking a temporary solution would be a wire rack cart on pneumatic wheels. Line cleaner – After cleaning my lines using c02 to push some cleaner, I need a better method to clean the lines. I haven’t decided on the plan yet. You can build a bottle powered cleaning device to CIP, to avoid wasting c02, or a pump powered device. I’m thinking about repurpace a small aquarium pump to recirculate deer line cleaner through the lines. I think a bucket, a pump, a short piece of tubing and a MSP connector and I’m all set. Picture this. Hang the bucket of beer line cleaner over the tap, disconnect the beer line, attach the msp to the small hose which is connected to the pump. Open the tap, turn on the pump. Viola, you’ve got a recirculating line cleaner.